NO-84 (PSAT) was launched in 2015 and although it’s been in orbit for some time, you will find a lot of people have only used the APRS Digipeater which is also a payload on the satellite, however, the main payload is a PSK Transponder. 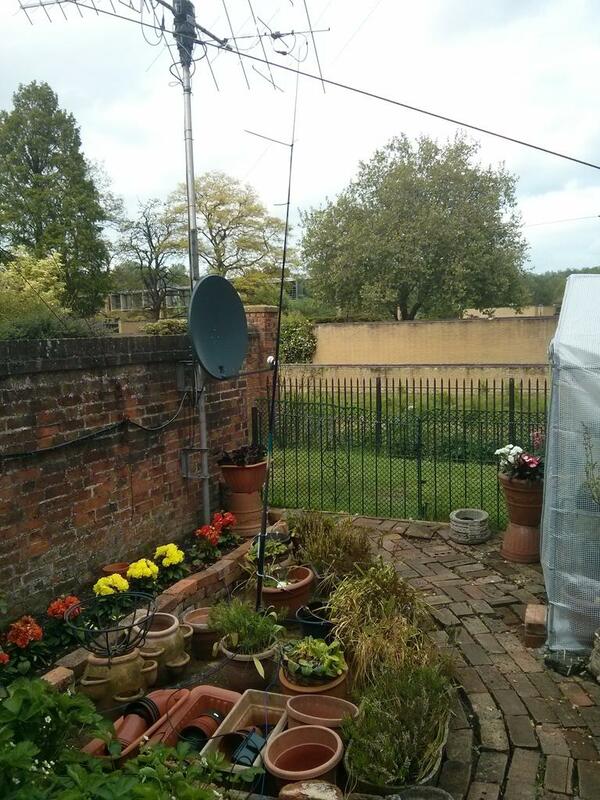 Uplink is on the 10m PSK frequency of 28.120 USB and it downlinks on 435.350 FM (PSK31), the satellite builders recommend using up to 75w into an omnidirectional antenna on 10m. I found with this setup I was able to activate the transponder with as little as 10w, however, of course, increasing the power made sure that NO-84 could hear my signal a lot more. Setting this up is simple, you download the application which is Java and launch it and then set some parameters. In Station -> Edit Station Information you specify your location like you would with any other tracking application. You then select the satellite you want to use by going to Satellite -> Choose Satellite and select NO-84. It’s worth noting you’ll need to manually update the TLEs, these are stored in the /tle/ subdirectory. I’d recommend using the https://www.amsat.org/tle/current/nasabare.txt once you have updated the TLEs relaunch the application. Select the output soundcard by clicking on Audio Device in the menu and selecting the correct one, remember this is the audio going to your radio. On the main screen of DopplerPSK you’ll notice you have some tracking information and boxes update the MyCall with your own callsign and press update. Notice below that there are prepopulated text inputs and radio buttons to represent the one that has been selected for now use CQ. Its generally recommended you transmit the whole time NO-84 is passing over. 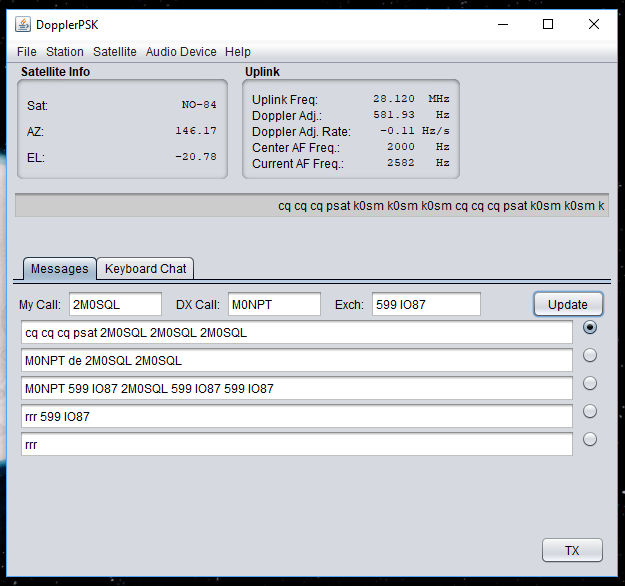 The other station will be on a different frequency to yourself, update their callsign in DXCall and the exchange and hit the Update button, again then select the message you want to send till the contacts complete. Then go back to CQ or reply to someone else if their calling CQ, this method seems to work well. The above screenshot is DopperPSKs main screen. 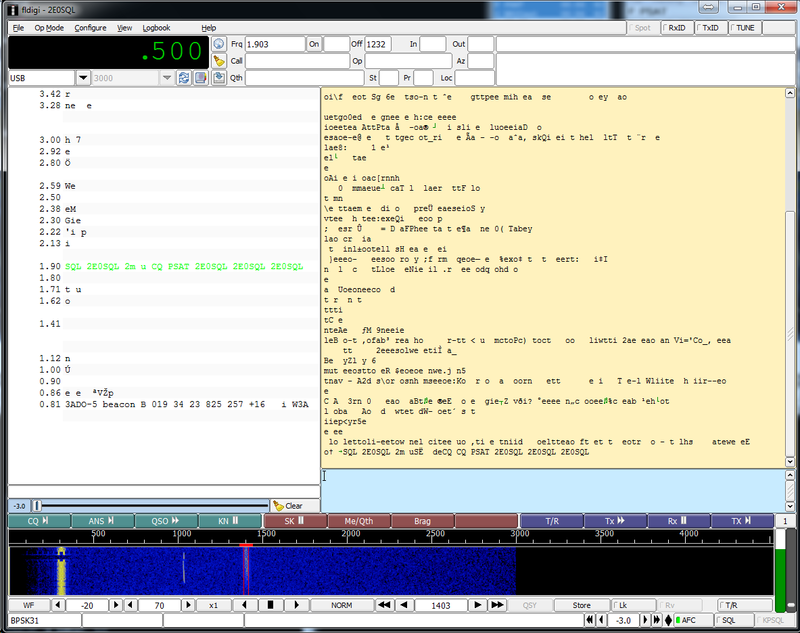 The above image shows FL-Digi decoding multiple signals, in this case, 2E0SQL and the satellite’s beacon. To decode the signals, I personally recommend using a PSK application that supports multi decoding, for instance, FL-Digi, you can watch all the stations on the passband and your own and carry out your contact with ease. Remember that if NO-84 doesn’t hear a PSK31 signal on 28.120 the transponder will not turn on unless it is sending its beacon signal. Hopefully, this gives you some idea how to setup DopplerPSK to complete a NO-84 PSK QSO. It’s worth keeping in mind that activity can be low, so do not be scared to ask for prearranged contact.